Who must file FBAR Form 114? A U.S. person with an interest in, or signature or any other authority over at least one foreign financial account is required to submit an annual FBAR report on Form 114. The filing requirement is triggered only if the aggregate value of all foreign financial accounts exceeded $10,000.00 or the equivalent in a foreign currency at any time during the year. A U.S. person is any U.S. citizen, U.S. resident, U.S. corporation, partnership, disregarded entity, estate or trust. U.S. residents are all individuals who meet the Green Card or the Substantial Presence Test in the reporting year. Foreign citizens who were determined U.S. residents under a tax treaty provision are also required to file the FBAR. Same applies to nonresident individuals who have elected to file a joint return with a U.S. citizen or resident spouse under the provisions of IRC 6013(g) or (h), to the extent they meet the Substantial Presence Test of Section 7701. Financial institutions include custodial, depository, investment, insurance, and certain other entities. Custodial entities are entities that hold financial assets on behalf of others as a substantial portion of their business. An example of a custodial entity is a bank, credit union, or financial agent. A depository institution is an entity that accepts deposits from the general public. The most common example is a bank. An investment entity is an entity engaged in the business of trading in financial instruments, portfolio management, or investing funds for others. Insurance entities deal with insurance contracts. Finally, other financial institutions are enumerated in Section 5312(a)(2) of Title 31 of the United States Code. Some of them include credit card operators, pawnbrokers, loan and finance companies, travel agencies, currency exchange bureaus, and even casinos and gaming establishments. A foreign financial institution is a financial institution, as defined above, which is physically located outside the 50 States, the District of Columbia, or the US possessions. Therefore, a branch of a US bank, based in Europe is a foreign financial institution. However, a branch of a foreign bank, located in the US is not a foreign financial institution. What is interest in, signature or other authority over a foreign financial account? Financial interest exists when you are the owner of the foreign financial account on record with the financial institution. This requirement is met even if you hold the funds jointly with others. Signature authority is defined broadly to cover individuals with no financial interest who have the power or authority to control the disposition of the funds in the account by direct communication with the financial institution. If signature authority is found to exists, it is irrelevant whether you have exercised your powers or not. Any other authority is the right to access funds held in a foreign financial account, either through a nominee, an agent or otherwise. For example, if you appoint an agent to keep funds in a foreign financial account under the agent's name, but you have control over the agent, an agency authority exists and you must file FBAR Form 114 if all other conditions are met. Which accounts are subject to reporting on the FBAR Form 114? Other Financial Accounts. In a landmark case, U.S. v. John C. Hom, the CA District Court ruled that PokerStars, PartyPoker, and other similar online gambling sites fall within the 31 U.S.C. 5312(a)(2) definition of a financial institution. Similar treatment applies to other persons, entities or agents that hold money for others or act in a similar way as a financial intuition. Consequently, should you have an account in a foreign casino, gambling or gaming site, and the funds are readily convertible into cash or other financial assets, you will be required to report it! Which foreign financial assets are not reported on the FBAR Form 114? Bitcoins. The Internal Revenue Services ruled that Bitcoin is treated as property for federal tax purposes. As such it does not meet the definition of a foreign financial asset. So, do not report Bitcoins and other e-money accounts on the FBAR. How to determine the value of the foreign financial account? 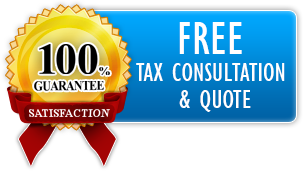 You are required to report the maximum value of each separate foreign financial account. The maximum value of an account is a reasonable approximation of the greatest value of currency or nonmonetary assets held in the account during the calendar year. For nonmonetary assets refer to Fair Market Value of each asset to obtain a reasonable approximation of the greatest value. Periodic account statements may be relied on to determine the maximum value of the account, provided that the statements fairly reflect the maximum account value. You may also contact the financial institutions for a precise valuation. If the maximum amount in an account is a negative number, record it as zero on the FBAR Form 114. The reporting currency on the FBAR Form 114 is always the U.S. dollar. Thus, if the account is maintained in a USD, no conversion is required. If the account is not in USD, you must first determine the maximum account value in the currency of the account. After the maximum value of the account is determined, convert the result into United States dollars using the Treasury's Financial Management Service rate in effect as of December 31st of the calendar year the report relates to. What is the FBAR penalty? Unarguably, the question that matters most is: “What is the penalty for a failure to file an FBAR?” And the short answer is severe! 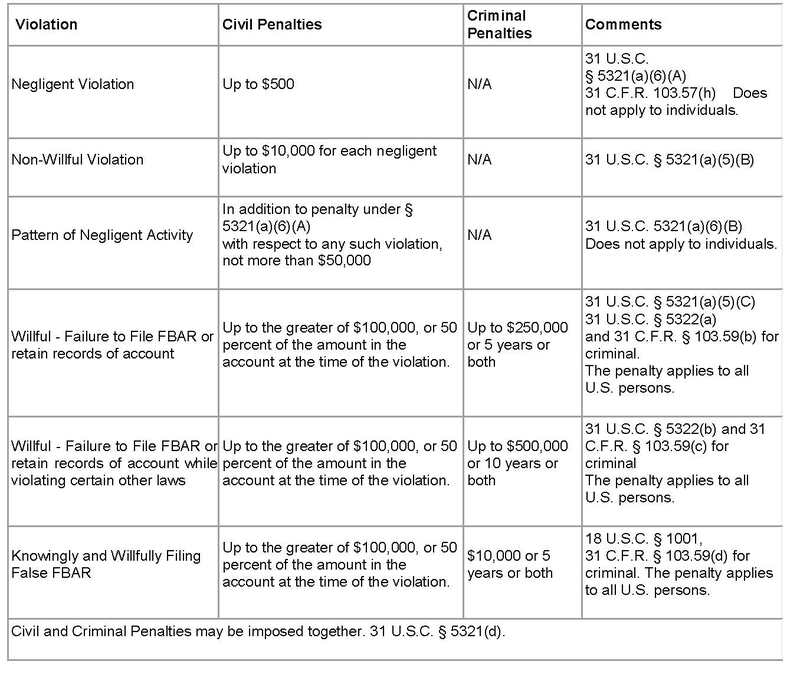 The following table released by the IRS summarizes the civil and criminal penalties that may apply depending on the type and reasons for the violation. The FBAR due date used to be June 30th of the year following the year the report relates to. All FBARs that are filed after January 1st, 2017 must be filed by the due date of the income tax return of the U.S. person making the report. Thus, if the U.S. person is an individual, the FBAR due date is April 18th, 2017. Expats and Americans residing abroad are allowed an automatic 2-month extension of time to file the income tax return and the FBAR form. Alternatively, a 6-months extension is also available if filed by the regular unextended due date. How to file the FBAR? File the FBAR Form 114 electronically with the Financial Crimes Enforcement Network. Extensions of time to file are also submitted online. And do not forget to contact us should you have any questions about the Foreign Bank Account Report.